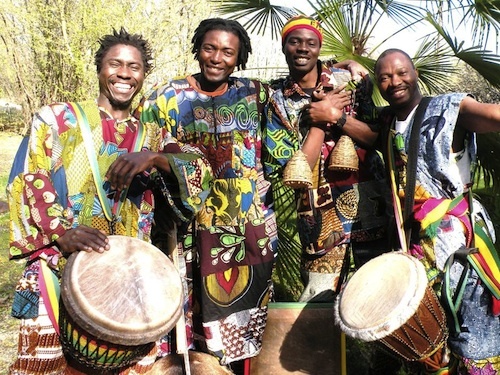 Veterans of Guinea’s world-renowned national company, Les Ballets Africains, Message From Guinea brings to life celebratory dance and percussion pieces that represent the traditions of several different ethnic groups. Featuring master Guinean drummer/dancers Manimou Camara and Abdoulaye Sylla, balafon virtuoso Naby Camara and special guest Madu Kone from Mali, tama drummer for Habib Koite. These artists light up the stage with a spirit of joy that will bring you to your feet. This entry was posted in African Dance, African Music and tagged Balafon, Music of Guinea, Tama talking drum. Bookmark the permalink. Thanks, Claire — I was so ready for this! But, I had my 9 yr. old granddaughter that evening — and don’t think kids are allowed, right? Dang! By the way, you probably know about this concert at Town Hall Jan. 24, but do you know about Goldstar half price tickets? http://www.goldstar.com/e/78749 Dang, unfortunately I can’t go to this one either!! FYI, Children under 18 are allowed until 10 PM, and we’ve had some good times with young audience in the past!